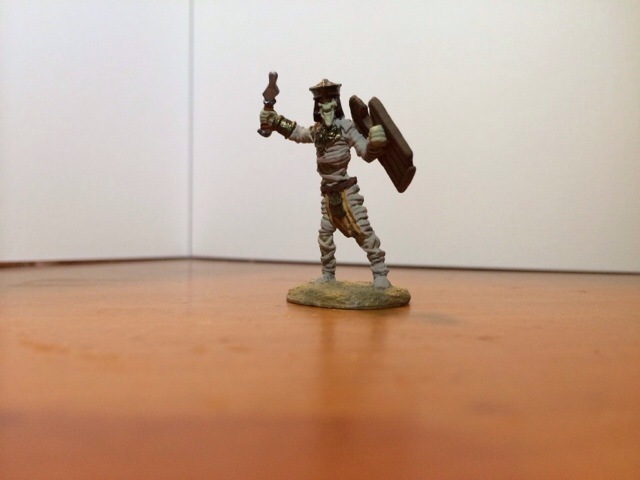 I went up to Reaper for paint club and worked on a mummy warrior mini. It was an experimental day as I was trying out some of the undead colors in preparation for working on the Zombicide minis. I liked how Reaper’s ghoul skin color worked for the exposed mummy skin. I also tried some washes to add shadow and depth to the mini. They worked well too! So I picked up a bunch more paints and headed home. Here’s a shot of the finished product. I was getting ready to ride in to an on-site meeting with the client this morning, warming up the bike and putting my cold weather gear on, when I noticed that it wasn’t rolling as well as it should have. So it went up on the center stand, transmission in neutral, and I started rolling the rear wheel around. Lo and behold, there’s a large staple shoved through the tread, with both points puncturing about 4mm apart. 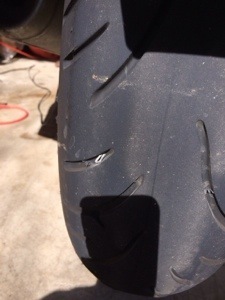 It’s really not safe to plug/patch that, so I’ll be replacing a tire with about 4,000 miles on it. I’ve been hunting around for new ones, and it looks like that’s going to end up being a $150 staple.